REWIND + PLAY presents a selection of key works from the first decade of artists’ video practice in the UK. Work of that period is characterised by self-reflexivity in the medium, by an investigation of the limits of the then-new technology and by opposition to the dominant video form of the time: broadcast television. With the notable exception of David Hall’s TV Interruptions, first shown unannounced on Scottish television in 1971, the works in this selection were made for gallery exhibition. 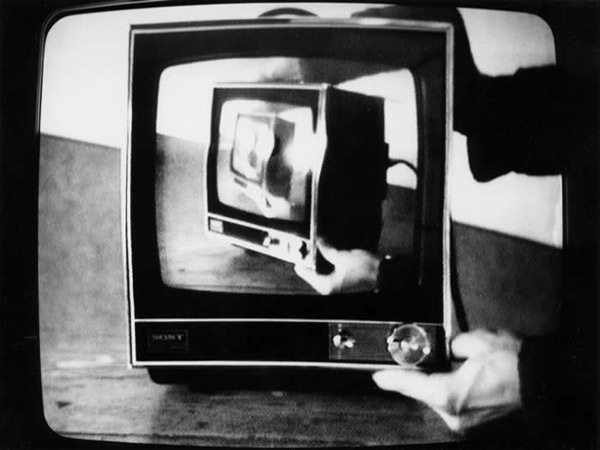 Before the advent of video projectors, work was produced and displayed using TV monitors, and the ‘box’ was recognised by some artists as an inevitable sculptural context that influenced the making and reading of their work. This was especially so in works which referenced television or were actually made for broadcast. Tamara Krikorian’s Vanitas (1977) and David Hall’s TV Interruptions (1971) are screened on a TV monitor for this reason.